Microsoft recently announced Visual Studio LightSwitch, a new offering in the Visual Studio product family. What is Visual Studio LightSwitch? Visual Studio LightSwitch is the simplest way to build business applications for the desktop and the cloud. LightSwitch makes building professional-looking, custom business applications practical and affordable through pre-built templates and tools in a simplified development environment. It can dramatically decrease the time it takes to build a custom application by automatically handling routine code and letting developers focus on the custom logic that makes their applications unique. Applications built with LightSwitch can easily be deployed to the desktop, a web server, or the cloud. You can read more at Jason Zander’s blog. Bring a mash-up of Flickr, Twitter, Facebook and blogs using this really cool application called Flotzam. You can even download the source code to customize your mash-ups. Flotzam was written in Windows Presentation Foundation (WPF), the design work was done using Blend and was brought to you by Karsten Januszewski and Tim Aidlin, both from the Developer & Platform Evangelism Division of Microsoft. Visit Flotzam and download the software and source code. Nagi, my esteemed brother :), has created a S+S solution (it’s in beta and not for general consumption, yet), called- “Where Am I?”. WAI is a great example of what can be done when various technologies (Virtual Earth, Windows Mobile, Windows Server, SQL Server, Visual Studio, ASP.Net, AJAX.Net, etc.) are put together to create this very cool service/solution. WAI allows your family and friends to track the whereabouts of you over the Internet- what a great concept, with amazing potential/possibilities! Please read more about “Where Am I?” here. Also, view Nagi’s video interview, which has just been released on Channel 10. Way to go Nagi! Microsoft just released a whole bevy of preview products, which you can find on MSDN. · Visual Studio 2008 Beta 2. Visual Studio 2008 is a unified development environment that enables developers and development teams to use a consistent programming model to create great applications across a spectrum of platforms, including the Web, Windows Vista, the 2007 Office System, SQL Server 2008, and Windows Server 2008. · .NET Framework 3.5 Beta 2. The .NET Framework 3.5 builds on the user experience, communications, and workflow advances of .NET Framework 3.0 and includes capabilities for better integration with data (LINQ), standards-based Web services support and more. · Silverlight 1.0 Release Candidate. Microsoft Silverlight is a cross-browser, cross-platform plug-in for delivering the next generation media experiences and rich interactive applications for the Web. This is the last step before the final code ships. 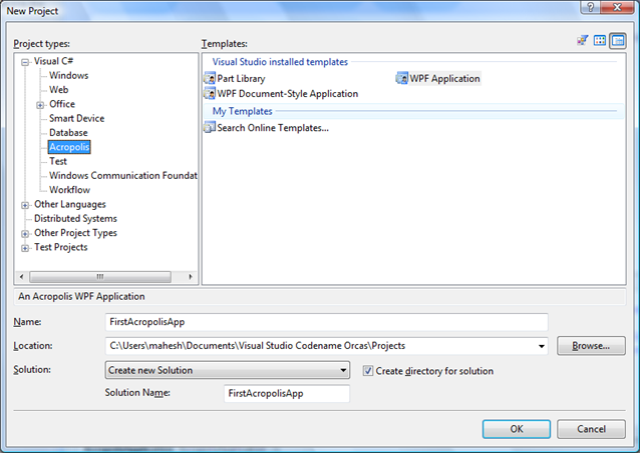 · Silverlight Add-In for Visual Studio 2008 (CTP). With this add-in, developers can start building Silverlight 1.0 applications from within the Visual Studio 2008 environment and work with their designer counterparts using Expression Blend August preview. Microsoft expects to deliver the final version of this add-in soon after the final version of Visual Studio 2008. · GoLive License. By agreeing to the terms outlined in the GoLive license, developers may build and deploy solutions today using Visual Studio 2008 Beta 2, the .NET Framework 3.5 Beta 2, and Silverlight 1.0 Release Candidate. · Final availability. Barring unforeseen setbacks, Visual Studio 2008, the .NET Framework 3.5, and Silverlight 1.0 are all scheduled to release to manufacturing (RTM) before the end of the year. The other day to help my partner better understand the key components & programs within Visual Studio Extensibility (VSX), I spoke to Anthony Cangialosi, who is a Program Manager within Visual Studio Tools Ecosystem, helped summarize the key components & programs within VSX space. Visual Studio Shell 2008 (VS Shell): The underlying IDE of Visual Studio that you can build your integrated or isolated applications on top of and redistribute. Visual Studio SDK (VS SDK): A software development kit that provides a set of samples and some helpful tools that shows you how to build Visual Studio Package. The Visual Studio 2005 SDK 4.0 is the last version of the SDK for VS 2005. Upcoming versions of the VS SDK will be for Visual Studio 2008 (code named Orcas) and beyond- the latest released version of the VS SDK for Orcas beta 1 is VS SDK Orcas June 2007 CTP. Package: An extension that loads in Visual Studio that provides some set of functionality. A tool window for example is defined in a package. VS SDK Assist: A community project that integrates into Visual Studio and helps build VS Packages. Unlike the SDK which provides a number of samples, this community project lets you add VS extensible features as elements of your project. Visual Studio Industry Partner (VSIP): refers to the marketing program, that provides access to technical resources and marketing benefits. More on VSIP here. MSDT: A set of technologies that are available for license independently that are in Visual Studio. For more information please visit the VSX Developer Center on MSDN. “Acropolis” Community Technology Preview (CTP) 1 is a set of components and tools that make it easier for developers to build and manage modular, business focused, client .NET applications. Acropolis is part of the “.NET Client Futures” wave of releases, Microsoft’s preview of upcoming technologies for Windows client development. Acropolis builds on the rich capabilities of Microsoft Windows and the .NET Framework, including Windows Presentation Foundation (WPF), by providing tools and pre-built components that help developers quickly assemble applications from loosely-coupled parts and services. Watch and learn more about Acropolis here. Visit Acropolis landing page here. Comments : Comments Off on Acropolis CTP is here! The new community site- www.windowsclient.net– for Windows Client Community went live yesterday night. The new site is a consolidation of all community sites surrounding .Net client development. The site focuses on all aspects of rich client on Windows using .Net Framework. The site will host content from both Microsoft product teams (Windows Forms and Windows Presentation Foundation) and from the community, to highlight user experience and developer productivity benefits of rich client applications on the Windows platform. This is the site where the product team will be publishing pertinent content, CTPs (Community Technology Previews), client videos etc. According to the Windows Client team, the main goal of the site was to setup a single location for the windows client community, in place of sites like www.windowsforms.net and wpf.netfx3.net; all content from these sites has already been migrated to the new community site.